Celebrate the circle with us at this Family Day. Artists have explored the circle for centuries. 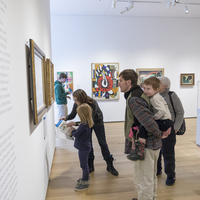 Join us for in-gallery activities, art making, and more! At 2:00 pm, don't miss a performance by renowned juggler Jason Tardy in our atrium. For children ages 4-12 with their adult companions. For more information call 603-646-1469.